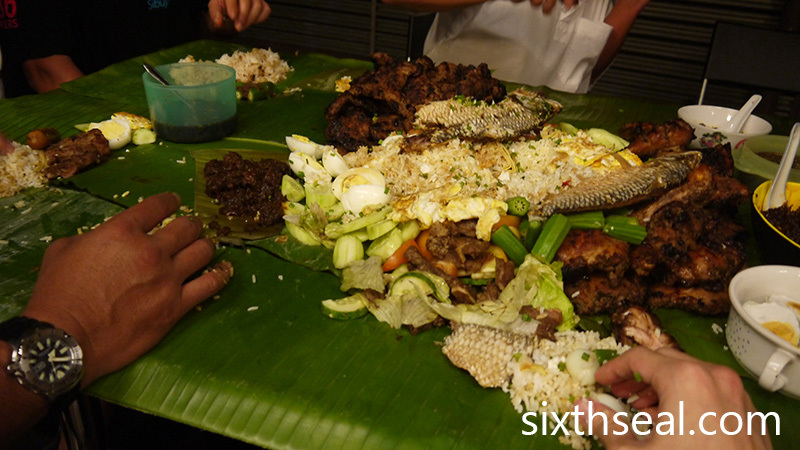 Boodle Feast – A Boodle Fight Meal! 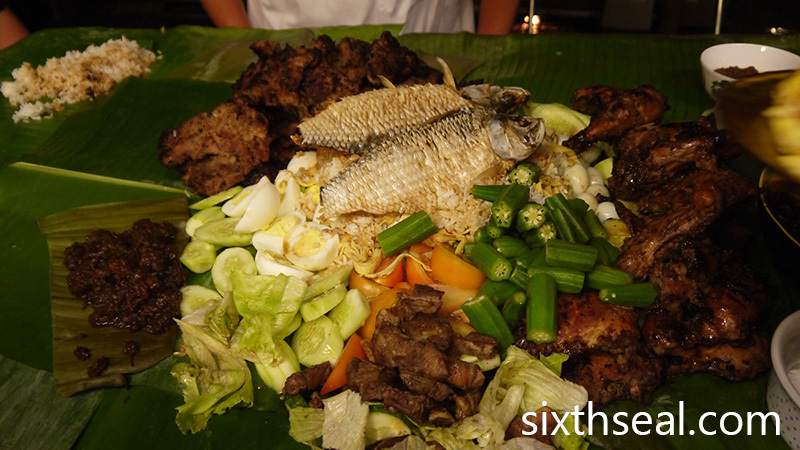 This is the Boodle Feast that we had earlier this week. 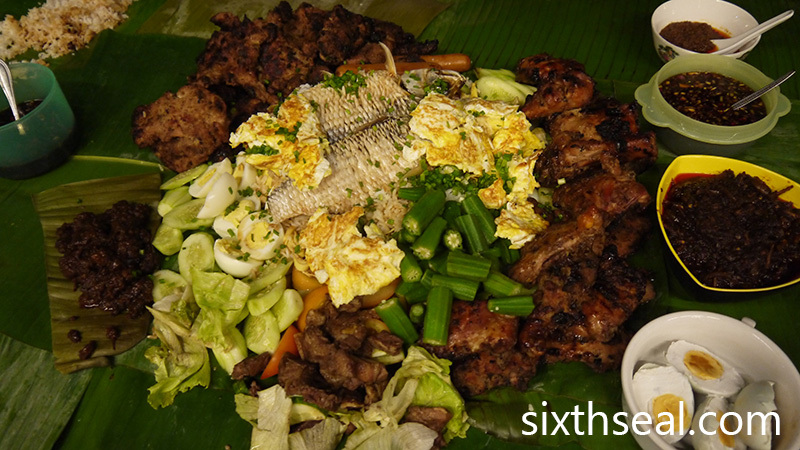 I had no idea what a “Boodle Fight” was until I saw photos of a previous one. 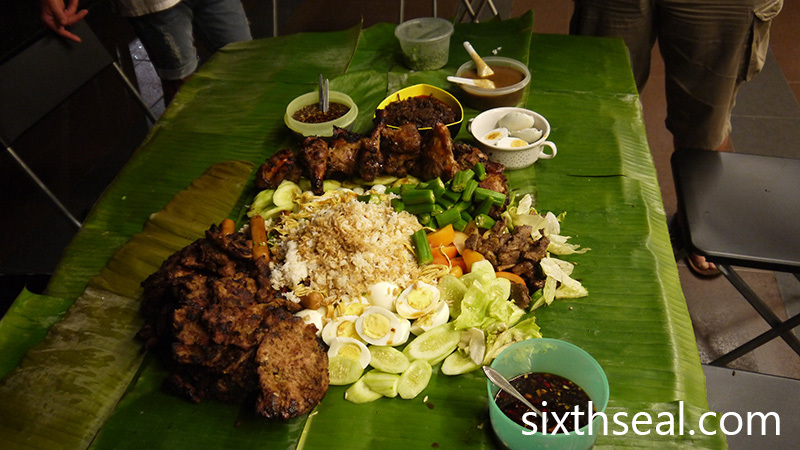 It’s a tradition from the Philippines where you eat with your hands from a communal mound of rice surrounded with meat and seafood on a bed of banana leaves. This seems to originate from the Philippine Military Academy, where they call it a Boodle Fight. My bro Eddy took the time to make this happen. It’s a good thing his wife is Pinoy (and cooks really well) and the 9 of us sat down to this unique dining experience at his home. 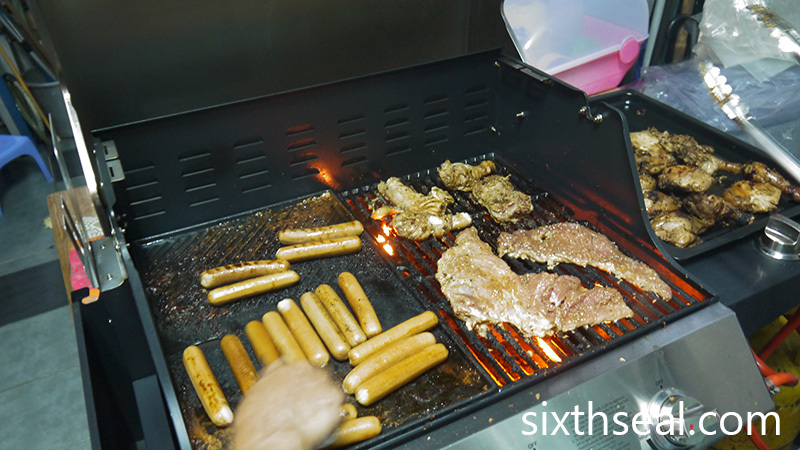 The meat is primarily grilled using the BBQ. Jona has been working the grill the entire day to prepare this dinner. There was the delicious ikan terubok (toli shad) – a popular local fish which is currently only available from several spots in Sarawak. This is what the fish looks like before cooking. It has been salted although it’s not salted fish per se. It’s a strange hybrid I’ve grown to love. 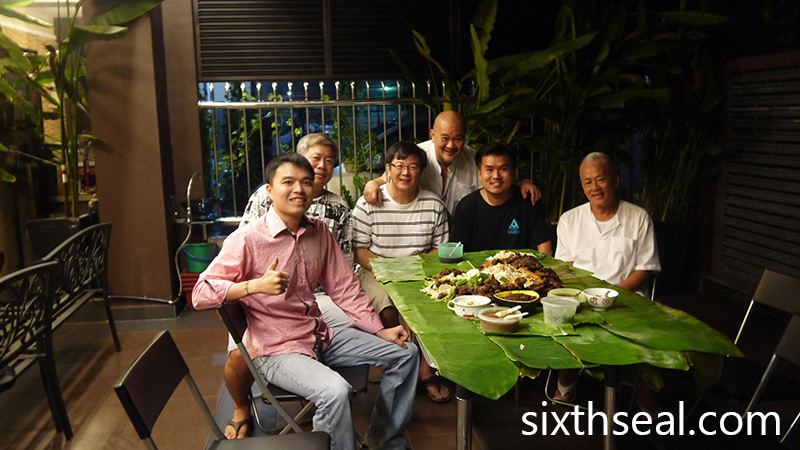 The banana leaves were laid down to cover two tables – first a bed of smaller leaves and then the full green luscious ones were put on top as the eating surface. 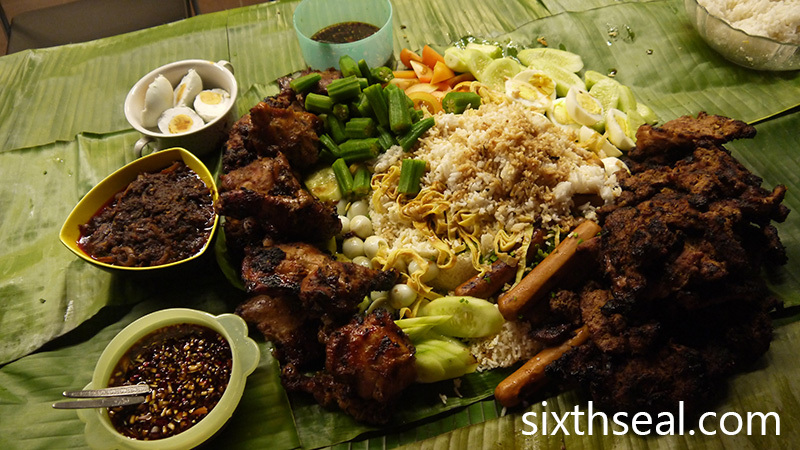 There are no plates or spoons – you use your hands for the Boodle Feast. It was a lot of food! There are three kinds of eggs – salted duck eggs were mixed into the rice together with boiled quail eggs and halved chicken eggs on the side. Pork chops, barbequed beef, mutton, chicken, fish and sausages represented the protein while cucumbers, okra and tomatoes provides a palate cleanser of sorts. I thought the tomatoes were brilliant as it gives a burst of citrus like tang, which prevents an overload from the massive amounts of meat. You basically take a portion of rice from the middle to your own eating spot on the banana leaf and start eating. Hands are utilized for everything and it made for a really unique and interesting no-cutlery-allowed eating experience. I ate so much from the boodle feast I felt like bursting! Wow! I love this Boodle Feast which is a real unique way of eating! I have the habit of using my fingers to peel prawns and tear chicken meat when everyone else would be sitting prim & proper with fork and knives at the banquet! I am used to their staring eyes. It tastes better with finger licking. All the yummy food laid on the banana leaves are my favourites too. The fish has very special scales like weaved handicrafts. Thanks for sharing new ideas always. I love how we have to get the rice from the middle too – there’s a communal mound of rice, but we take a portion and eat it on our own areas in the banana leaf. It’s a very different experience to eat using your hands – very visceral and enjoyable somehow, I ate a lot more than I had space for but it was all good. 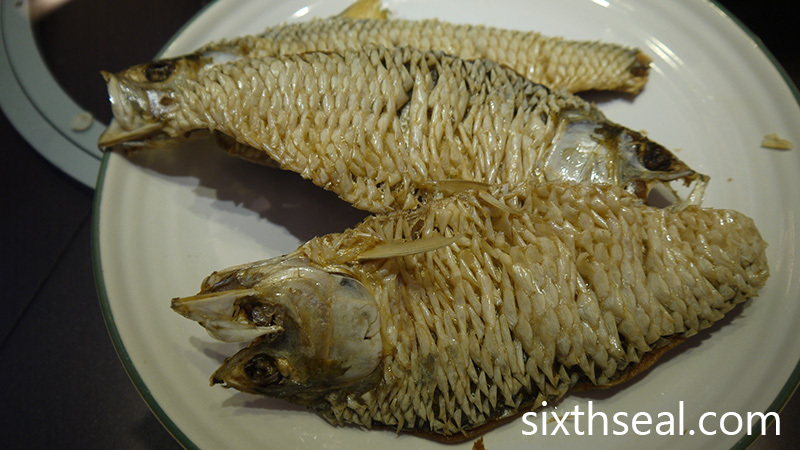 The fish is a special local fish that we fry whole, scales and all. I love it. Cheers! That looks so so so good. Do they open for home catering…or what do you call that kind of thing? People coming to your house like going to a restaurant and eating there? I saw Eddy that day at Soon Hock, Sunday – I was leaving Chopsticks after the beef noodle breakfast. I’m pretty sure they don’t open their house for “eat with” social dining experiences though. However they have dinner parties for friends very often, I eat here almost every night when my dad was hospitalized in Singapore last week since there was no one at home. Eddy has always been a graceful and generous host, most of us in the photo are long time friends. Boodle feast! Something new to me. So much food on that banana leaf. I do not mind eating with hands. Used to do that when in school. Enjoyed my pack of nasi lemak with classmates. Haha. I like eating with my hands too, it’s a totally different experience from regular dining. I used to do it when I was a kid too, it’s like returning to caveman roots, a more visceral and enjoyable experience although there’s a risk of eating more than you should when you eat this way. Haha. this is kinda new to me too….and FUN! but without spoon, I tink I would hav difficulty in scooping the rice from the communal area to my personal spot. I don’t know how to (properly) eat with my hands either. I can’t do the scooping motion that some people can to eat cleanly by using their thumbs to slide the rice in. I just grab it with my fingers but it works well enough. Very interesting stuff, I loved the experience. Indeed, my bro’s wife is really good in cooking, I always enjoy eating at their place. wow! Nice & most happy to see Sir Eddy in tip top condition. Note: Teruboks are available from Thai & Vietnam as well. Those ATM @ Satok are not local. Yeah, ikan terubok is even available from Sri Lanka and Bangladesh! Those are the dried and yellow ones you see in hypermarkets and some local markets though. The toli shad from those countries aren’t as good as local ones. I thought some of the Satok market sellers carry local fish? Wow! I love this too, especially every must use fingers to eat. So interesting and yummy. 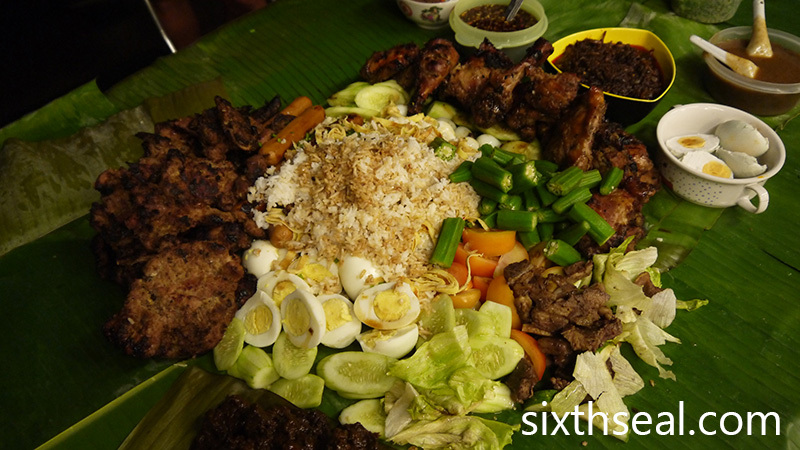 Boodle feast is loaded with so much carbs and proteins. I love those sambal chili. There are a lot of eggs (one of my favorite foods) inside too – quail eggs, chicken eggs (fried and boiled), salted duck eggs etc. We wanted to put in century eggs too. The sambal goes very well with the tomatoes and rice! 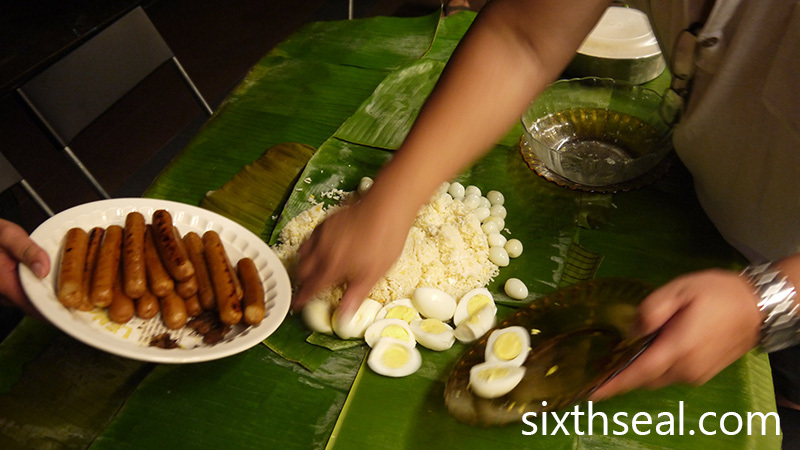 It started from the Philippines military, this tradition and has spread to all places even US Embassies and spawned a chain of restaurants offering a variation of the Boodle Feast / Boodle Fight. It’s interesting to replicate this here too! My family is used to eating with hands. When I was younger, we used to share a pack of nasi lemak with friends and eat with our hands. 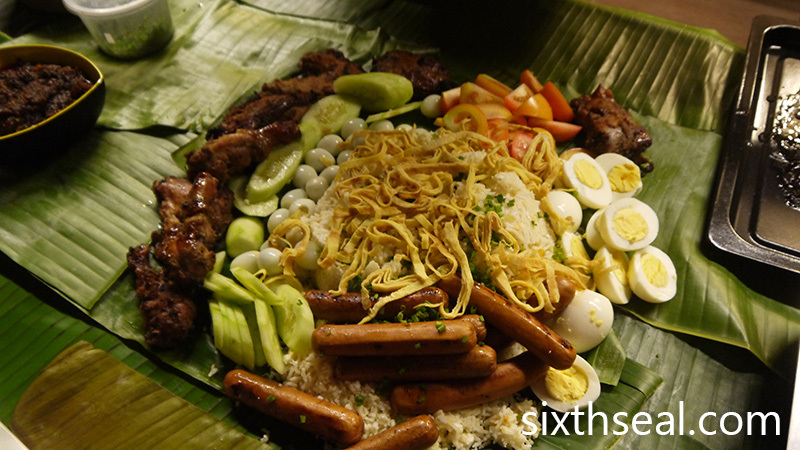 That is the closest we get to our own version of Boodle Feast. Haha. I ate with my hands are home sometimes when I was a kid too. It’s a lot of fun, can eat more (although Chinese food is less suitable coz of soups and gravy heavy dishes and such). This is a fun way to replicate a military eating style from the Philippines. Ehh, this is interesting.. I’m gonna sapu all the eggs and sausages and mutton first, haha.. 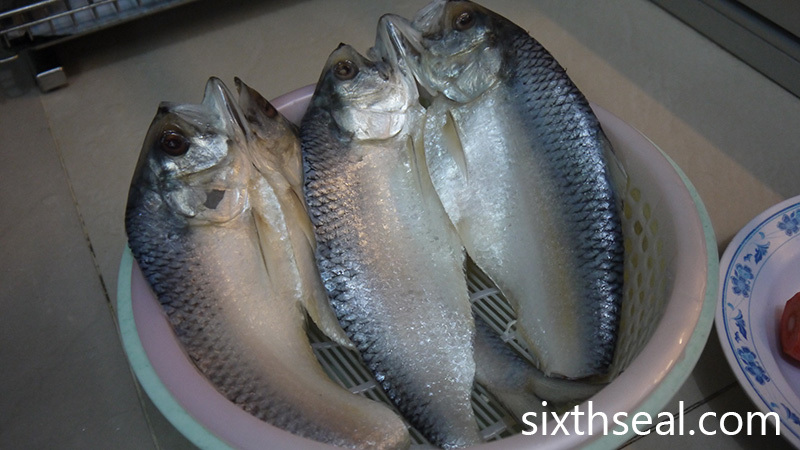 I love toli shad, we have a lot of Sri Lankan and Bangladeshi imports but they don’t taste the same – it’s been too dry and oily and can’t be resuscitated since it’s almost shrivelled from the excessive salting to make it last longer. The local ones still look like regular fish, not like salted fish, it’s just salty so you have to soak it for around 8 hours. I haven’t had this type of meal before. It’s a Philippines tradition apparently, started out in the military academy and spread around the country. There are places offering Boodle Feasts / Boodle Fights over there too, large chain restaurants. You need a large group to eat this though, although if you do it at home you can manage with a smaller group. Wow, interesting! Thanks for sharing! Definitely an eye opener for me! I was glad to have the opportunity to experience this meal, courtesy of my bro Eddy and his wife. I like the look of all the food, especially the fish and the eggs but I don’t think I can eat rice with hands since I have never done so before. Maybe I can if I am starving, hahaha! You’ll get the hang of it after a while, it’s very intuitive. It’s fun to eat from a communal mound of rice and you take what you want and need to your own side of the banana leaf. Very appetizing to eat this way for some reason, and liberating too! First glance I thought it was banana leaf rice.